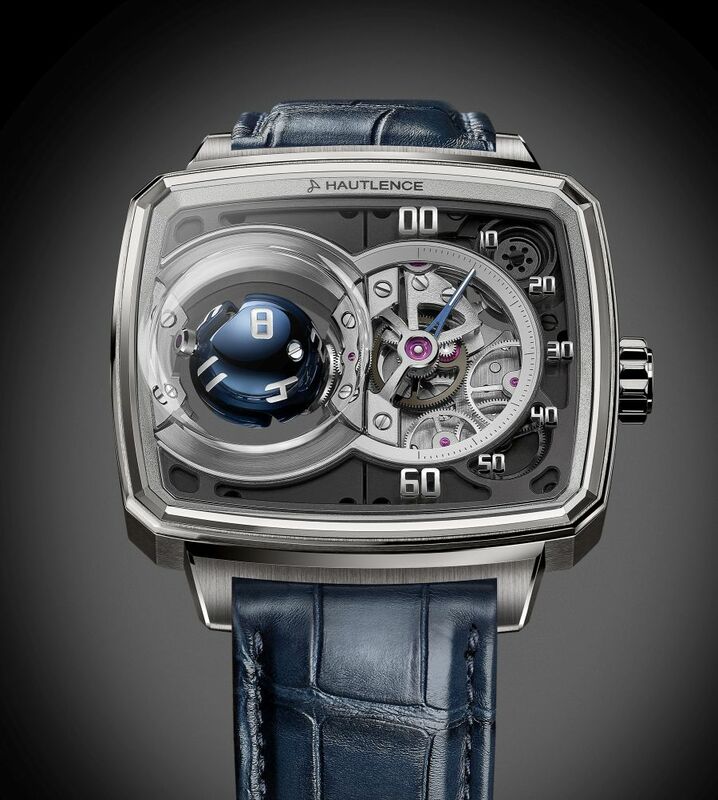 Hautlence are a brand that is not above a bit of fun, and being unexpected. Last year they launched the HL Kinetic table clock, a time piece which displayed hours and minutes via spheres in two transparent columns. Each black sphere, featuring skeletonised hour and minute numbers, rotates around a central axis. Following a pattern driven by a differential with four bevel gears, the spheres rotate around two intertwined axes. The spheres complete one increment per hour, and their ‘dance’, as Hautlence calls it, is on-demand and can be activated for about ten minutes. The clock is powered by a rechargeable lithium battery, and as each column functions independently, you are not restricted to putting them exactly next to each other. There was mention that the HL Kinetic was a hint about a new movement to be launched in 2019 (but in a wristwatch form), and Baselworld 2019 is where the new limited edition (twenty-eight pieces) HL Sphere 01, with a spherical ‘ jumping’ hour and retrograde minutes, makes its debut. This is a very cool watch. On the left is a blue PVD-treated Grade 5 titanium sphere, underneath a domed sapphire crystal. Comprising of two parts, it features twelve engraved numerals and rotates 450 degrees on itself courtesy of four conical gears that move around two crossed spindles (at 21 degrees) through three rotation axes to reveal the current hour. The numerals are laser engraved and filled with white lacquer. On the right of the dial is the open-worked retrograde minute display, with a hand that travels along a minute track. This aperture brings the gear train into view, which slows down the course of the minute hand when it returns to zero, regulating its speed so as to reduce impact forces. The differential and snail used to trigger the jumping hour can also be seen beneath the minute hand. The minute hands are satin-finished Grade 5 titanium with blue PVD treatment and white lacquer filling. The base dial is skeletonised and rhodium-plated. There is then an intermediate dial, which is smoked metallic sapphire crystal and has the applied diamond-polished rhodium-plated numerals. Finishing wise, both front and back are sand-blasted, with components decorated and finished by hand. Of course, unlike the clock this is mechanical, using their eighth in-house movement. The manual-wind Calibre HTL 501-1 with 38 jewels, 21,600 VPH, and a power reserve of three days. The calibre is fitted with a safety mechanism that protects the movement during reverse time setting. The skeletonised balance bridge has a proprietary balance spring produced by sister company Precision Engineering. A skeletonised drum and ratchet reveal the barrel spring, thereby providing a simple yet ingenious visual indication of the power reserve. The case, in 18kt white gold, measures 39mm x 46mm x 12mm, and it is water resistant to 30m. It comes on a rubber-lined blue Louisiana alligator strap with folding clasp in Grade 5 titanium. The RRP is 99,000 CHF/ 97,800 EUR.